For the brewery, see Żywiec Brewery. 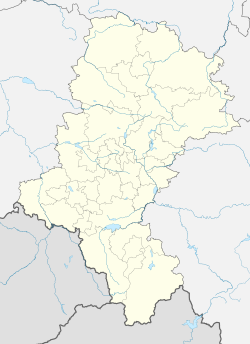 Żywiec /ˈʒɪvjɛts/ (Polish pronunciation: [ˈʐɨvjɛt͡s]) (German: Saybusch) is a town in south-central Poland with 32,242 inhabitants (as of November 2007). Between 1975 and 1998, it was located within the Bielsko-Biała Voivodeship, but has since become part of the Silesian Voivodeship. The town is situated in the center of the Żywiec Basin, on the Soła river near Żywiec Lake in the Lesser Poland historic region and includes Żywiec Landscape Park, one of the eight protected areas in the voivodeship. 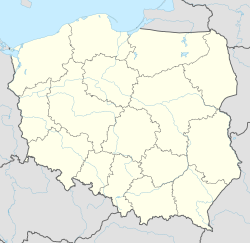 Żywiec was first mentioned in a written document in 1308 as a seat of a Catholic parish. It was originally located in the place later known as Stary Żywiec (lit. "Old Żywiec"). It belonged then to the Duchy of Teschen, and after 1315 to the Duchy of Oświęcim, which in 1327 became a fief of the Kingdom of Bohemia. The town was a focal point for the development of hitherto sparsely populated Żywiec Basin. The area of Stary Żywiec was prone to flooding so the town was moved to the current spot in 1448. In 1457 the Duchy of Oświęcim was purchased to the Polish Crown. In 1624 it was acquired by Constance of Austria, queen consort of the Polish king Sigismund III Vasa. During the Deluge, Żywiec was plundered and destroyed by Swedish troops in 1656. From 1672 it was a possession the Polish chancellor (Kanclerz) Jan Wielopolski. The Old Castle was built in the mid-14th century. The castle has undergone several restorations and boasts a number of styles of architecture and decoration, including Gothic, Renaissance and Baroque. Żywiec's Old Castle is encompassed by a 260,000 square metre landscape park, which was established initially in the 17th century. The Church of the Holy Cross was built towards the end of the 14th century, and expanded twice, once in 1679 and again in 1690. In the 18th century, a Baroque church was later constructed on the site and still stands today. A second noteworthy church, the Cathedral of the Virgin Mary's Birth, was constructed and expanded during the first half of the 15th century, before being renovated in Baroque fashion after a fire in 1711. Upon the First Partition of Poland in 1772, Żywiec became part of the Austrian Kingdom of Galicia. In 1810 it was purchased by Prince Albert of Saxony, son of King Augustus III of Poland and again ruled with the neighbouring Silesian Duchy of Teschen. When he died in 1822, his estates fell to Archduke Charles from the Austrian House of Habsburg-Lorraine. The town also houses the Żywiec Brewery, established by Charles' son Archduke Albert in 1852, and purchased by Heineken International in the 1990s. A museum was founded at the site in 2006. Following the 1939 Invasion of Poland, Żywiec was occupied by Nazi Germany. The last Habsburg owner Archduke Karl Albrecht of Austria refused to sign the German Volksliste, whereafter he was ousted and arrested. Between September and December 1940, the Nazi authorities deported 17,413–20,000 Polish inhabitants from around Żywiec county in the so-called Action Saybusch conducted by Wehrmacht and Gestapo. The expelled Poles were taken to the General Government (German: Generalgouvernement, Polish: Generalne Gubernatorstwo), a different region within Poland under German military occupation. The incident formed part of the Nazis' efforts, led by Reich Minister Alfred Rosenberg and his deputy Alfred Meyer, to develop the Occupied Eastern Territories for settlement by German migrants. ^ a b "Żywiec". Archived from the original on 2009-04-29. Retrieved 2010-02-05. ^ "Heineken International". Archived from the original on 2009-12-19. Retrieved 2010-02-05. ^ Mirosław Sikora (20 September 2011). "Saybusch Aktion - jak Hitler budował raj dla swoich chłopów". OBEP Institute of National Remembrance, Katowice (in Polish). Redakcja Fronda.pl. Retrieved May 5, 2012. ^ Etlin, R. A., John. Art, culture, and media under the Third Reich. Chicago: Chicago University Press, 2003. ^ a b c d e f g h i "Internetowy Serwis Miejski". zywiec.pl. 2008-06-20. Archived from the original on 2011-05-14. Retrieved 2011-06-03.